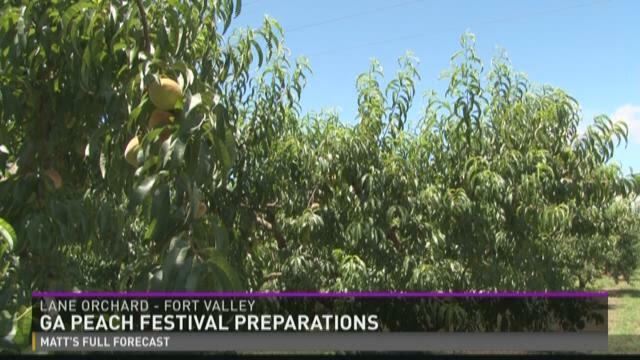 Khoury says the festival celebrates the boom that these orchards provide to the community. The festival has many activities all day long for adults and children. From the Kiwawans pancake breakfast in the morning, to the parade through downtown Fort Valley. A highlight for many, is a taste of their legendary cobbler which is 11 by five feet and eight inches deep. "The worlds largest peach cobbler will be ready at 2:00, and they start at 2:00 tomorrow morning preparing it," Khoury says. Kids can enjoy the Peach Beach in front of the entertainers grandstand while adults enjoy vendors. This peachy event wraps up with a concert and fireworks display just before 10 p.m.
"The band is the Soul Purpose band," Khoury said. "They're awesome. They play a little bit of R&B (and) a little bit of beach music. They got a little bit for everybody." The event gets underway tomorrow at 7 a.m. in downtown Fort Valley.